Derwent London is pleased to announce that it has pre-let most of the remaining office space at 80 Charlotte Street W1 to The Boston Consulting Group (“BCG”). BCG will take the top 5th to 8th floors comprising 123,500 sq ft on a fifteen-year lease with five-year rent reviews and an option to break after twelve years subject to a penalty. The initial rent is £10.6m per annum, slightly above ERV. In addition, Arup Group (“Arup”) has now committed to take a further 19,800 sq ft on the 4th floor on the same terms as its other office space, a twenty-year lease at an initial rent of £1.5m per annum subject to annual increases of 2.25% for the first fifteen years. Arup has also relinquished its option to take the remaining space on that floor. Including the space Arup previously committed to occupy, we have now pre-let a minimum of 276,900 sq ft or 86% of the total office space in the project for a rent of £21.8m per annum. BCG also has the right to take up to a further 43,000 sq ft comprising 20,100 sq ft on the 4th floor, which was previously under option to Arup, and 22,900 sq ft on the ground and lower ground floors. The rent free periods on the let space are in line with the earlier Arup letting. Should BCG take up all their additional space this significant Fitzrovia building would be 99% pre-let. 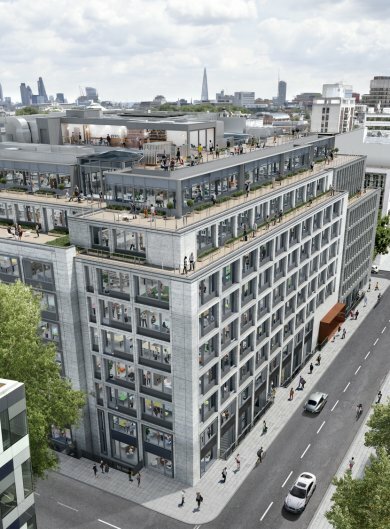 The 80 Charlotte Street development campus totals 380,000 sq ft in three buildings designed by Make Architects and construction is due for completion at the end of 2019. 80 Charlotte Street is the largest building at 323,000 sq ft. The two other buildings total 12,000 sq ft of offices and 45,000 sq ft of residential space. Following today’s announcement a minimum 83% of the total commercial element is pre-let with BCG having the right to occupy another 13%.